Poster for the theater plays “M. 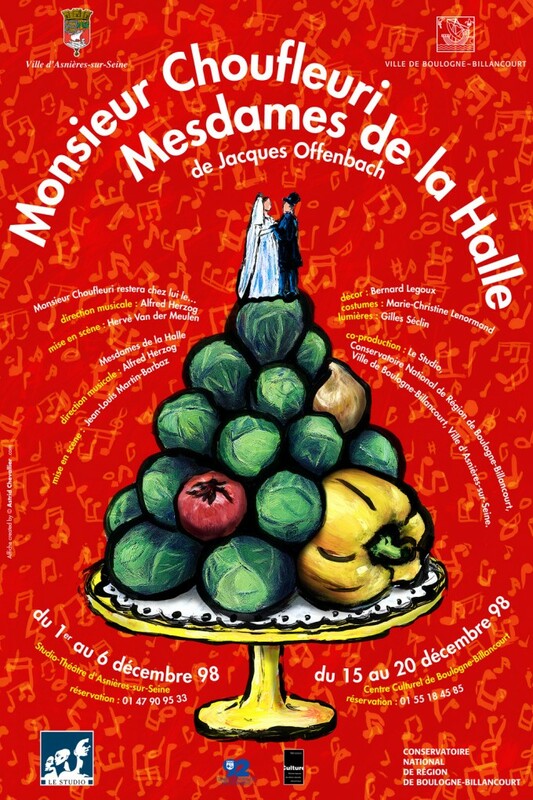 Choufleuri restera chez lui le…” and “Mesdames de la Halle” by Jacques Offenbach… An evening of Love, weddings, and lots of vegetables! An opéra bouffe, in one act. The plot: The newly-rich but culturally ignorant M. Choufleuri invites the upper crust of Paris to a private party and “musical soiree” (at his bourgeois drawing-room, furnished in vulgar taste) by celebrated 3 real life Italian opera singers: soprano Henriette Sontag, tenor Giovanni Battista Rubini, and baritone Antonio Tamburini. All three become indisposed at the last minute, but Choufleuri’s daughter, saves the day by impersonating Sontag and insisting that Babylas – whom she has been seing secretely – impersonate Rubini, and that Choufleuri himself masquerade as Tamburini. The deception works, and Choufleuri rewards Babylas with his daughter’s hand in marriage. An opérette bouffe in one act. At the Paris fruit and vegetable market vendors of all kinds are plying for custom. The plot: The elegant drum major Raflafla, though no longer that young, still makes an impression on the market women of the Paris halls. However, he has got a rival: Croûte-au-pot, the cuddly cook, to whom Mme Poiretapée, Mme Madou and Mme Beurrefondue would happily give the love of their second spring. Croûte-au-pot, meanwhile, is in love with a fresh fruit dealer, Ciboulette, who was born among the potatoes and celery and knows only the market, not even her parents. When a quarrel about the favour of Croûte-au-pot ends in a salad battle that can only be stopped by the police, Mme Poiretapée tries to talk Croûte-au-pot out of courting Ciboulette. If she herself were the girl’s mother, she argues, she would never agree with the liaison. This leads to a discussion about Ciboulette’s parents. Mme Madou and Mme Beurrefondue declare themselves potential mothers, but a sealed letter which Ciboulette has faithfully worn at her bosom for several years and whose content she at last reveals to the public, leaves only two alternatives. Raflafla and Mme Poiretapée both faint at the same time, thereby removing any doubt.